The house call is back! Urgent Care in the comfort of home! Download the FetchMD app to get started. 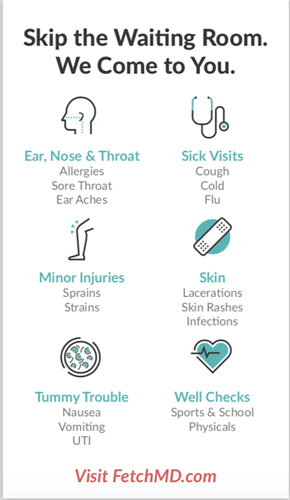 FetchMD is an on-demand house call service providing a consumer friendly, low cost, and convenient alternative to going to the urgent care center or ER. With FetchMD, you don’t have to sit for hours in the urgent care center waiting room to be treated for a minor illness or injury. Just fetch your visit with our app and our medical team will come to you, complete with a clinic on wheels! You’ll get the personal attention and time to address your healthcare needs that you deserve—minus the commute, the mound of check-in paperwork, the uncomfortable exam room, and the unknown wait times. Plus, our flat fee of $119 per visit eliminates those complex, confusing health care bills. FetchMD is available seven days a week, and cares for children and adults. With our partnership with H-E-B Pharmacy you can even have your prescriptions delivered for free should you need them. It’s ridiculously easy to get started. Simply download the FetchMD app from the App Store or Google Play and fetch your visit. Learn more at www.fetchmd.com. The house call is back! FetchMD is your on-demand urgent care center, that comes to you wherever you are. 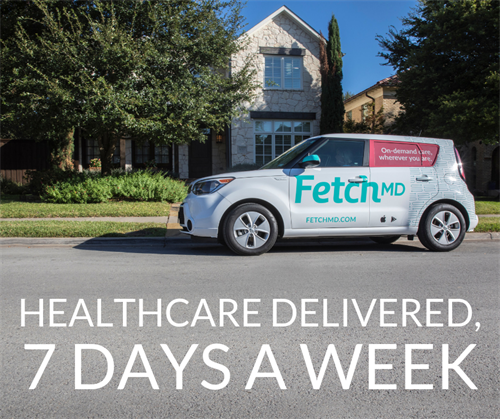 FetchMD is available seven days a week. FetchMD treats children and adults.